At a time when California’s coast faces more and more threats every day, from things like coastal development, seawalls, illegally restricted beach accesses, and exploitation of resources (unpermitted sand mining, anyone? ), it’s a no brainer for the government to take all available measures it has to protect the public lands that it holds in the public trust, from those threats. That’s why the Obama Administration is currently considering adding five already federally owned coastal places, totaling roughly 6,300 acres, to the existing California Coastal National Monument. Surfrider Foundation strongly supports the proposal. The California Coastal National Monument was established by President Clinton in 2000 and ensures that included properties are protected from resource-destructive activities including mining, logging, and mineral and geothermal leasing. The Monument originally included about 20,000 rocks, small islands, and other geologic formations along California’s 1,100 miles of shoreline, and in 2014, President Obama expanded the Monument to include the Point Arena-Stornetta Public Lands, in Mendocino County. Now, new Golden State areas up for consideration include Trinidad Head, Lighthouse Ranch and the Lost Coast Headlands on Humboldt County’s coastline, the Cotoni-Coast Dairies property in northern coastal Santa Cruz County, the historic Piedras Blancas lighthouse near Hearst Castle in central California, and a small grouping of offshore rocks and islands in Orange County. If added to the existing Coastal Monument, these special coastal places would receive the same protections from degrading practices like mining, and would also reap the benefits of additional federal resources for better management, and public access opportunities. While some of the proposed areas are already accessible and highly enjoyed by the public, like Piedras Blancas, which serves as an elephant seal rookery in San Simeon, California, and Trinidad Head in Humboldt County, the Cotoni-Coast Dairies property is not. This is a gorgeous property with rolling hills overlooking the ocean. It’s already owned by the Federal government, and would provide families and individuals alike a perfect opportunity for low impact coastal recreation like hiking and wildlife viewing. 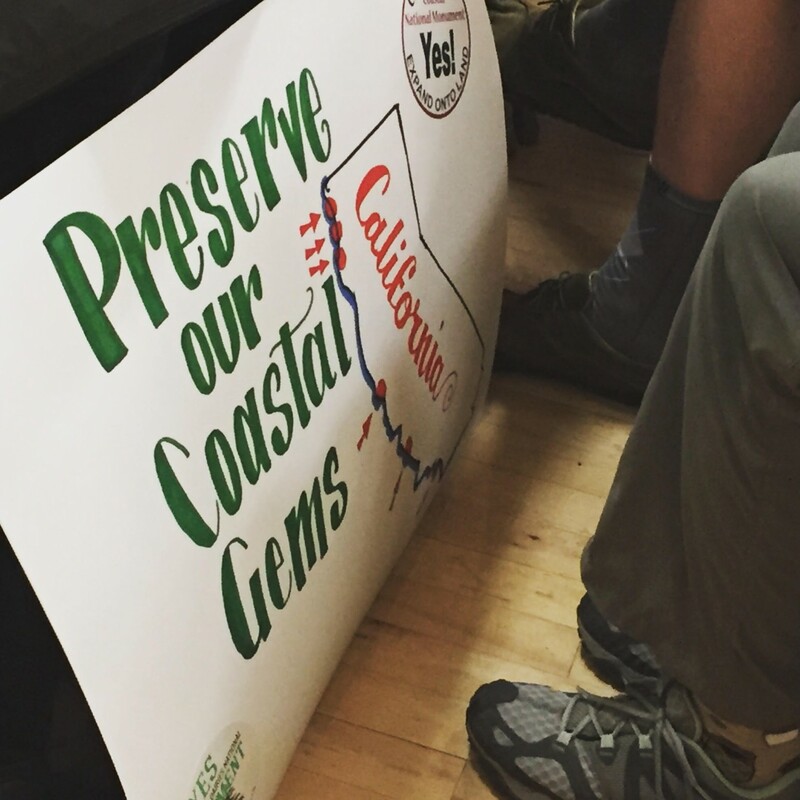 Government officials recently held a public meeting in central California to hear the public’s thoughts and concerns about the proposal. The meeting, held Friday September 16 in Cambria, drew a standing-room only crowd. 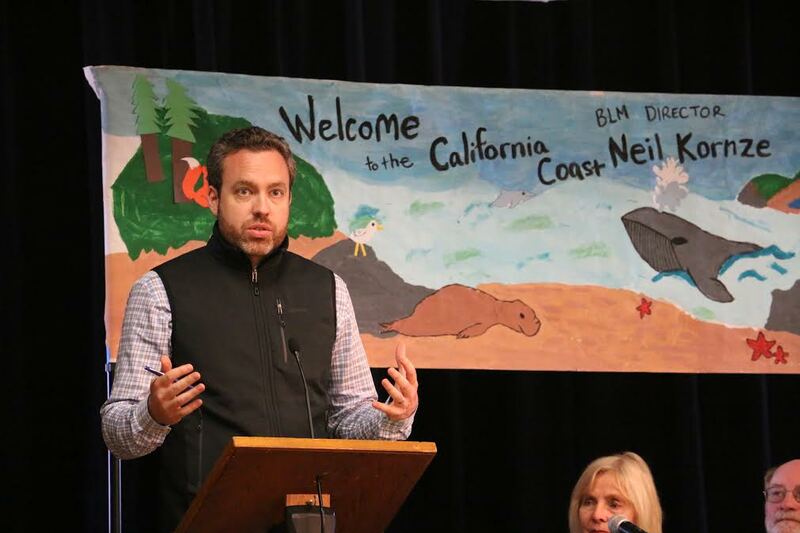 Among those officials in attendance were U.S. Representative for California Lois Capps and the Bureau of Land Management Director Neil Kornze. While some attendees spoke against the expansion – primarily residents in north Santa Cruz County who opposed including the Cotoni-Coast Dairy property, citing concerns over traffic and drawing in crowds – the majority of speakers, including California residents and representatives from Native American groups and environmental groups including Surfrider Foundation, Sempervirens Fund, Conservation Lands Foundation and The Wilderness Society, expressed strong support for expanding the Monument to include the proposed lands. Surfrider Foundation, represented by Surfrider’s California Policy Manager Jennifer Savage, Legal Associate Staley Prom and local San Luis Obispo Chapter members Brad Snook and Carol Georgi, expressed support due to the increased public recreational opportunities and enhanced resource protection the Monument designations would bring. For additional background, last year, Senator Barbara Boxer (D-CA) introduced the California Coastal National Monument Expansion Act, to expand the existing Monument to include the proposed areas. Meanwhile, the U.S. President has the discretionary authority under the Antiquities Act (34 Stat. 225, 16 U.S.C. 431) to declare by public proclamation historic landmarks, historic and prehistoric structures, and other objects of historic or scientific interest that are situated upon the lands owned or controlled by the U.S. Government to be national monuments. Therefore, along with many other supporters, Surfrider Foundation is hopeful that during the upcoming final months of his Presidency, President Obama will exercise this authority in favor of California’s coast, and the public’s right to enjoy it, by expanding the California Coastal National Monument by proclamation. You can voice your support by sending an email to the Obama Administration here. By speaking up, together we can permanently safeguard species habitat, and improve public recreational opportunities at these coastal areas.